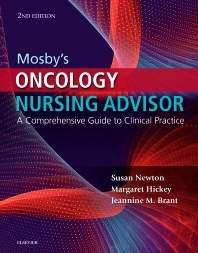 Get quick access to the most important information surrounding cancer and oncology nursing care with Mosby’s Oncology Nursing Advisor, 2nd Edition. Covering everything from the various types of cancer and cancer treatment options to patient education and nursing best-practices, this indispensable nursing guide is like getting seven books in one! Plus, its user-friendly layout and straightforward coverage make it ideal for use in any clinical setting. With 17 new chapters, updated evidence-based content throughout, and proven patient teaching handouts, this new edition offers the authoritative guidance you need to provide the best possible oncology nursing care. Coverage of cancer management principles outlines a wide range of treatment and pharmacologic modalities, including surgery, chemotherapy, radiation therapy, hormonal therapy, immunotherapy, and complementary and alternative therapies. Symptom management guidelines offer in-depth coverage of pathophysiology, signs and symptoms, assessment tools, lab and diagnostic tests, differential diagnoses, interventions, patient education, follow up care, and resources for over 30 common symptoms associated with cancer and cancer treatments. Essential information on many oncologic emergencies and emergent issues prepares readers to respond quickly to structural, metabolic, and hematologic emergencies. Section on palliative care and end-of-life issues offers helpful guidelines for dealing with topics related to survivorship, palliative care, the final hours of the cancer patient, and loss, grief, and bereavement. Section Seven. NURSING PRACTICE CONSIDERATIONS NEW!